Here’s something a little bit different for this challenge: me interviewing my own brother. Before we launch into it, let me tell you how things work in my family: I am the clown, my sister is the diplomat, my brother is . . . the skeptic. Now, if you’ve got even the most basic knowledge of birth order under your belt, you can guess that I just listed us all from youngest to oldest. You can also guess that the Big Brother Skeptic does not always take too seriously what comes from the Little Sister Clown. When I came to Eric with the theory that he would do well to eliminate gluten from his diet, he just rolled his eyes. I know what he was thinking: “Here we go again”. I’m sure he figured this was one more strange flight of fancy. Like yoga, or summers lived out of tents. (And if he thinks this is weird, let me say in return that I am totally mystified by what he and his friends do: meet up in one house with all their individual laptops, set themselves up at couches or tables, then compete video-game-style for hours straight while eating pizza and not speaking, as warlocks, or wizards, or ninjas, or… I don’t even know.) You get the picture. We are different, my brother and I. We are also the same. There’s just no getting around genetics. Like my mother, our grandmother, and many other relatives on down the line, we struggle with health issues commonly linked to gluten. My grandmother’s intestinal troubles, especially, have been romanticized into family lore. A woman whose frail appearance belied her inner strength, she raised four children with ferocity, love, and a whole lot omy grandmothertomach pain. The greatest treat in their home was an avocado: one ofhe only things my grandmother could comfortably eat. On a good day, mom, her sister, and t brothers found enough coins on the sidewalk to run home with a market avocado in their hands. My grandmother was also known for drinking loads of coffee. Constantly. All day long. Paired with the stomach … in that really makes no sense, but with her limited food options, coffee was an available vice. I get it. avocados disrupting her system. I would bet that with some progressive information, and a foray outside of traditional Italian cuisine, she could have broadened her diet. 2) The only explanation my grandmother ever received for her digestive troubles was… bleeding ulcer. She never underwent a stomach scope or other medical proedure for proving this as fact. She simply described to her doctor what happened whe she ate, and he offered up the diagnosis of an ulcer. I wasn’t there for their converstion. I wasn’t even born yet. But I do have trouble believing someone with an ulcer wuld have less abdominal pain when drinking copious amounts of coffee. Peptic and beding ulcers are the most common misdiagnoses given in place of celiac disease and gluten intolerance; their symptoms can mirror each other. 3) Let’s backtrack to that word “diet” for a moment. We know a lot more about eating disorders now than we did in 1951. This is not to say that Anorexia and Bulimia did not exist. They did. Just not in the same in-your-face, People Magazine, spindly mannequins, Ally McBeal sort of way. The “avocado and coffee for stomach pain” story? That may have flown back then – I don’t believe it would now. Several of my more contemporary family members have struggled with eating disorders; they have all woven much more convincing tales. I’m sure her stomach pain was real. There’s a reason why eating disorders are one more symptom of celiac disease and gluten intolerance: if eating food makes you feel terrible, chances are you will develop an issue with it. I reflected a lot on my grandmother when muddling through my own debilitating health issues a couple of years ago. Long story short: it was frustrating, it was confusing, I was given multiple misdiagnoses (including bleeding ulcer), then finally I was found to have celiac disease. Fast forward one entire, gluten-free year later, and I was in pretty excellent health. I wish the same could have happened for my grandmother. I was determined to bring the same experience to my own family members; starting first with my brother. By the fall of our visit, Eric had been taking a combination of Zantac and Prilosec for eight years straight. Zantac is prescribed for stomach ulcers, Prilosec for gastroesophageal reflux disease (GERD). Both drugs come with some pretty hefty side effects – constipation, diarrhea, headache, gas, nausea, stomach pain, vomiting. These are the most common complaints. They typically subside over time, and then leave people like my brother with a much higher quality of life. Until stuck in the depths of my own health struggles, I’d never known how sick my brother had once been. We’d talk on the phone, and I’d tell him whatever illness my doctor was most recently investigating: Lupus, Irritable Bowel Syndrome, Ovarian Cancer. He would sympathize by telling me how much chronic pain he used to live in and then say, “but at least I knew what it was”. 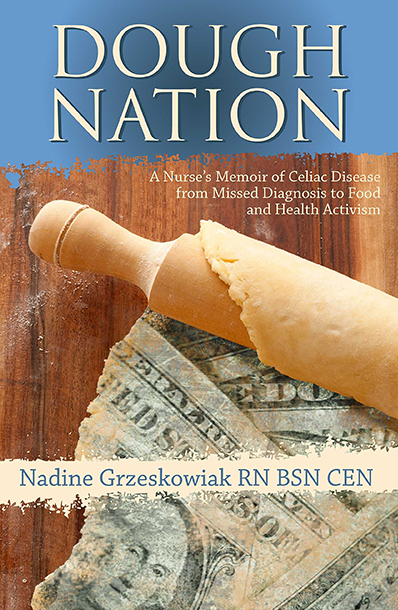 Celiac disease is passed along the family line through a genetic marker. While I am the only one in my family to have been tested for celiac disease, symptoms of that and gluten intolerance are rampant throughout our family – arthritis, eczema, insomnia, restless leg syndrome, nose bleeds, mineral deficiencies, intestinal upset, thyroid disease, adrenal fatigue, miscarriage, fertility issues, addictive behaviors, acid reflux, ulcers – we cover the spectrum. One more strike against us: our Italian heritage. Celiac disease is more common in Italians, and in that country all children are screened for the disease by the age of 6. What a difference that must make: an entire upbringing unhampered by the toll taken on the body – physically and emotionally – by food. I explained this all to my brother on the phone leading up to our visit. I thought I made a convincing case but he would only say, “there is no way I will go off that medication. Ever. I can’t live without it.” I sighed, “ok”. And then I packed my bags and my children for the six-hour drive to Bainbridge Island. Instead of inundating Eric with information and impassioned speeches, I should have just sent a current photo of myself. As soon as I walked through the door of his house he said, “Wow. You look GREAT”. That was huge. Compliments from a big brother – no matter how grown up everyone gets – are not easy to come by. But this one was well deserved. On our last visit, I was fifteen pounds heavier, exhausted, covered in rashes, vomiting on a regular basis, and experiencing other things not meant for polite conversation. Now there I was, back to my old self: brighter skinned, lithe, and full of energy. So much energy, in fact, that while Eric worked I tried to make sense of his bachelor pad (he was using red plastic kegger cups in place of water glasses, not even kidding) while pulling it together slightly. I also made a nightly dinner, which was a little like participating in some Reality TV cooking contest. My brother travels a lot for work. He has created a groundbreaking program for improving water quality and consumption, and is constantly in the air or on the road to somewhere, consulting with state and county agencies, or speaking at universities (once at OSU, for my friend’s class, where the professor said it was “a privilege to have him”. My brother.) Saving the world does not leave a lot of time for tending to his own health, or even basic grocery shopping. His cupboards reflected that. What little food he had did not exactly go together. It was like the ultimate Top Chef challenge: pull together a gluten-free meal from the refrigerator and pantry of a bachelor pad. I did it…every night that week. We had a great visit. We ate well. We road the ferry East, where we walked through Pike’s Place Market to munch on juicy plums and select fresh seafood. We road the ferry West, where my daughter whispered to Eric, “I looked really hard but didn’t see any fairies on the boat”. (Fairy Boat. Ha!) He showed her jellyfish instead. Those are the sorts of things we talked about. But gluten? We talked about that not at all. I’d given my brother all the practical facts on celiac disease before our visit, and he wasn’t swayed. So rather than spoil our time together with confrontation and debate, I figured these two things: 1) I would never change his mind; 2) there was no way he’d stay successfully gluten-free with his hectic, travel-packed schedule. That would take real dedication. And belief. Four weeks after our visit my brother called me to say: he’d gone gluten-free! My skeptical brother – who professed he’d be on stomach medications and a mac-n-cheese/pizza/fettuccine diet for life – had gone gluten-free quietly and all on his own. He managed to do this even with back-to-back road and air trips for half that time. He ate out as much as always, but at Mexican chains like Qdoba, Chipolte Mexican Grill, or Baja Fresh, where gluten free meals can easily be had through choosing nachos, tacos, or (so long as that facility uses a separate grilling station) corn tortillas. When dining out for business, he used his judgement to pinpoint what might be gluten-free, then made sure to check with the waitstaff. Not a big drinker to begin with, he found it easy to switch to a glass of wine instead of beer during those same dinners. I had two questions for him: What made him decide to go gluten free, and why hadn’t he told me earlier? Eric said it had been hard for him to buy into the theory that gluten could be a cause of sickness. He believed wholewheat products to be healthy and wholesome, and the gluten-free movement to be a fad – like the Atkins or Zone Diets. The information I gave him was not convincing because, he said, anyone can look up anything on the Internet and find the facts to make their case one way or another. It was only seeing me that convinced him otherwise. He was astonished to see the difference in my appearance and energy level; amazed that someone could go from being tested for debilitating, potentially fatal illnesses to a full recovery just through a change in diet. He also saw that going gluten-free wasn’t as overwhelming as he thought it’d be. I didn’t make a big deal out of our meals being gluten-free, but because I was eating with him, he knew that they were. And he didn’t feel like he was missing a thing. Except, of course, for stomach pain and acid reflux – which he still dealt with on a minor level even with the constant stream of Prilosec and Zantac. As for why he hadn’t told me, well, he didn’t want to give me the opportunity say “I told you so” – not unless he got real results from going gluten-free. And he had! In just four weeks, Eric had managed to stop taking Prilosec and Zantac entirely. That’s right. No more symptoms of GERD and no supposed ulcer. The pains, bloating, indigestion, lethargy, burning, nausea, vomiting, and headaches he’d once experienced after eating had disappeared. He was not just committed to remaining gluten-free, he was passionate about it. This was really a shock for me. Of all my family members, he was the last one I expected to make a major health change. But as he said, “it was a no-brainer”. The four weeks of radical improvement were proof enough. There was no reason to go back to gluten, and he expressed no feelings of loss over eliminating or swapping out certain foods. He was now telling his friends and our family members, “it’s really so easy to go gluten-free”. That was a year and a half ago. Things have dramatically changed for my brother since then. With ulcers and GERD at bay, he noticed other underlying symptoms which lingered, then eased as well. His ecxema cleared up, he began to fall asleep easily and stay that way throughout the night, became more energetic and lost twenty pounds. He stopped using red kegger cups for water glasses. But this has nothing to do with going-gluten free. This has to do – you guessed it – with a woman. Eric married his best friend of sixteen years, Miranda, and the two merged their little families into a great big one full of sons: his ten year old; her five-year-old twins and also her seven-year-old. Oh yes, and the recent addition of a baby girl. Clearly they have a lot to balance in combining homes, schedules, belongings, personalities and parenting styles. With all of that, fitting enough chairs at one dinner table was accomplishment enough; filling each plate with the very same foods was not on the agenda. While Eric’s transition to gluten-free had been a smooth one, he could not imagine imposing his dietary needs on others – especially in a time of such great change and compromise. It just seemed . . . too much to ask. So he quietly prepared his own gluten-free version of the same meals. When they had spaghetti, grilled cheese, pizza, burritos, or pizza . . . so did he – but with rice, quinoa, or corn instead of wheat. I questioned him gently on this approach. Was it easier, really, to go through the effort of shopping for and preparing an entire second meal? Did that make any sense when, in the end, they would all essentially be eating the same thing? And was he concerned about the risk of cross-contamination? Or…the high probability that his biological son and daughter would benefit from eating gluten-free as well? His answers, in short order: yes, yes, no, and maybe. Even the most informed gluten-free individual can have a hard time buying into the idea of cross-contamination. Sure, they may realize you can’t just remove breadcrumbs from salad or eat the filling of a pie while avoiding the crust. These things are visual. But many will doubt the fact that gluten can be spread through the use of porous (plastic or wood) utensils, cutting boards, and counter tops. Gluten is insidious. Trace amounts will remain embedded in these items, even when washed between use. The air itself can pose a risk. Particles of flour remain in the air for up to 72 hours after having been sifted, poured, and stirred during the baking process. No matter how careful you are to prepare your own, gluten-free meal, you can never be truly gluten-free so long as others in your home are not. Eric discovered this for himself within the first month of sharing a kitchen and the dinner table with his newly expanded family. His acid-reflux returned, along with some minor intestinal upset. It was not as extreme as before and he was able to get by without medication. Then came a couple nights of vomiting after dinner time, similar to what had caused his physician to prescribe Zantac in the first place. Eric called me up. He wanted to know, “could I really be getting sick just from living in a home that has gluten in it?” Yes, yes, yes! And just in case he wouldn’t believe me, I posed a challenge. I invited Eric, Miranda, and their entire family to join in on our 6-week long, gluten-free trial. Just six weeks! Surely they could commit to that. Eric and Miranda went through the process of cleaning out their kitchen. Items with gluten were discarded or donated to a food bank. Wooden utensils and cutting boards were replaced. Every inch of cupboard and counter space were thoroughly scrubbed. Their shopping lists were altered: pastas, cereals, sauces, soups, and dressings all became gluten-free. Breads were the hardest to replace. There is no denying that most gluten-free breads have a different, less satisfying texture. The boys were less than pleased with their sandwiches. I suggested they try Udi’s brand sandwich bread, and this was a hit. Flax-4-Life muffins passed the test as well. Gluten-free tortillas helped make fresh, filling, wraps a part of the routine. Nacho night was a favorite. The whole family was eating gluten-free. But keep in mind – this family extends beyond more than just one. Miranda’s three sons spend every other week with their father. Eric’s son is with his mother during school days. No matter how amicable ex-husbands and wives may be, asking them to change the way they eat and prepare their food can feel like a bit much. Convincing others of the risk in eating gluten can be a slow, daunting, process. While Eric and Miranda informed their respective ex-spouses of the dietary changes in their own home, they did not request that the same be done in these other homes. Only one of their children was getting a fully gluten-free experience: their infant daughter. And, yes, gluten is passed through breast milk. Eric’s acid reflux, intestinal upset, nausea and vomiting subsided very quickly. By the end of the second week he was eating trouble-free. While Miranda did not identify any specific health complaints at the beginning of the challenge, she did note an increase in energy. Both parents were happy to see their daughter sleeping for longer stretches at night and crying less during the day. Coincidence or not, Miranda felt the changes on their shopping list and in the kitchen were manageable, and that Eric’s health was worth it. The end of the six-week challenge coincided with a family gathering in Portland. It was a meet-the-baby, meet-the-in-laws party, held at the home of Miranda’s aunt and uncle. I traveled prepared not only with gifts, but also a bag full of snacks my children could safely eat on the go – dried apples, Larabars, popcorn, trail mix, beef jerky, fruit strips. There’s nothing worse than having two small children with you who are, a) hungry, and b) feeling excluded by diet. Something I could not pack for? The grown-up version of hungry exclusion: being questioned, grilled, and often even challenged on the necessity of living a gluten-free lifestyle while we eat. Eric and I both dislike this very much. We agree it takes all the enjoyment out of dining with others. I was in for a happy surprise. Miranda’s aunt had taken the time and consideration to prepare a fully gluten-free snack and multi-course dinner. She knew even to avoid her regular cutting boards, wooden utensils, and other porous cooking supplies that have been used for preparing food containing gluten. We spent the afternoon grazing on an array of fresh fruits and vegetables, tasty crackers, homemade dips, chips and salsa. Dinner was spaghetti with marinara made from scratch; free-range sausage; bread rolls with seasoned butter; marinated golden beets with grilled asparagus, gorgonzola, and walnuts; and (what was of course the biggest hit with the younger set) vanilla cake and chocolate chip cookies. I could not stop thanking Miranda’s aunt for her kindness and hard work. She brushed it off like it was nothing. What she said was, “It’s a lot easier for me to buy a different kind of pasta than it is to prepare two different meals. And certainly easier than it is for you and your brother to deal with getting sick”. She was right, of course. But people rarely see it this way.